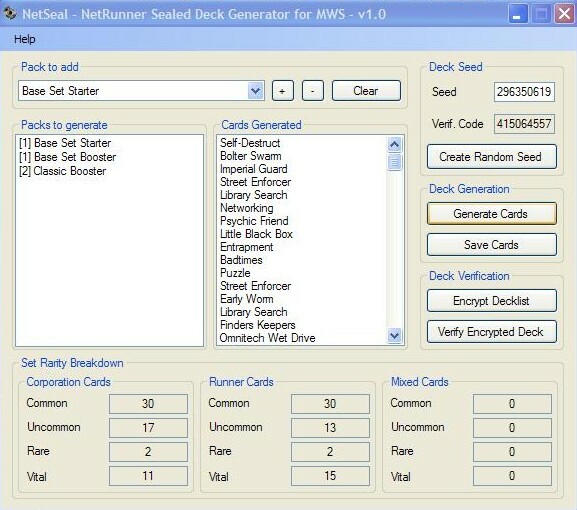 NetSeal is a program made to generate NetRunner sealed decks; the program itself is made with .NET, which means you need the .NET framework to use it; anyway, most recent version of WinXP already have it installed. NetSeal is available on the download page. To generate a sealed deck, start choosing a seed; this can be created randomly, or entered manually. In case of tournaments, you'll probably need to enter the seed assigned to you by the tournament leader; if instead you're playing sealed with a single opponent, you can both choose at the same time about half of your seed and half of your opponent's seed: this way you will be sure your opponent isn't going to use a "good" seed he had found in the past. You can now select the starters and boosters required; you may of course put multiple copies of each type if you need. When you select one of them, on the bottom of the window you'll see a rarity breakdown of how that starter/booster is composed. Use the +/- buttons to increase or decrease the desired amount of that type of starter/booster. When everything is set up, just click "Generate Cards" and a set of random cards according to your specifications will be created. Remember that given a certain seed, and a certain set of starters/boosters (the order in which you entered them does not matter) you will always obtain the same card set. All that is left to do now is saving your cards: click on "Save" and you'll be asked where to create your two decks. I've said two since the program, to ease deckbuilding, already splits the Corporation and Runner cards into two different decks. The program will then check if the cards contained in that deck are all taken from those your opponent has found from the seed given by the one who organized the tournament. 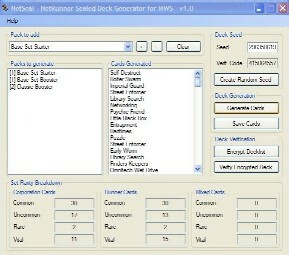 If the deck results legal, NetSeal will also provide MWS's code of that deck. Be sure at the beginning of the game that this code matches, otherwise it means your opponent is using a deck different from the encrypted one he has sent you. A final note: if the tournament leader has the time to do so, he can just request all player to send the encrypted files to him; he can then verify each deck, and just make public the MWS codes. NeatSeal will make the job a lot faster than him looking at each single card by himself, and players will just need to check if the MWS code of their opponent matches.